35" x 32" x 32"
"Contrapposto Chairs" were created in order to enliven a living room while still providing fairly traditional, functional seating. Contrapposto is a sculpture term that describes the position of the human figure standing with most of its weight on one foot so that the shoulders and hips tilt at opposing angles. This gives the figure a more dynamic and more relaxed posture that has been considered an important devise in sculpture since the Greek Classical era, the most familiar example being David by Michelangelo. By dropping one arm down and lifting the opposite "shoulder" up, these otherwise standard armchairs slip into more natural, relaxed postures themselves. 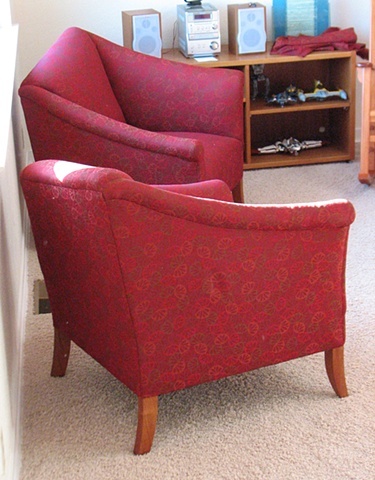 In addition, the two chairs are mirror images of each other. The lowered arms open towards one another in order to encourage interaction between the chairs' occupants.